No More Thai Temple Brunch in Berkeley? Berkeley’s Thai Temple : the only place, besides Vegas, where you can you find large masses of people eating buffet-style and changing their money into chips in the same place. For those of you who frequent the Asian Ghetto (or is it the Durant Food Court? 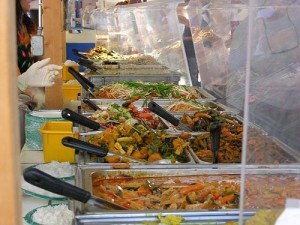 ), Thai House, or Tuk Tuk Thai to get your fix of the flavors of Thailand, consider your life incomplete. Thai brunch is perhaps one of the oddest, most aggressive, and certainly one of the most memorable dining experiences you will ever have. Tucked within the residential district of South Berkeley between MLK Jr. Way and Otis St., Wat Mongkolratanaram’s Sunday brunch is the equivalent of a cheap Asian restaurant transplanted into the cement backyard of a temple, which also offers Thai language and dance lessons to interested diners. The food is served cafeteria-style (we enviously wonder if their cafeterias in Thailand are really like this) and visitors exchange tokens to receive almost any Thai dish imaginable. Anyway, we’ve told you about this place before . What can we say? We love our Thai food. So although being neighbors with a Thai buffet is something close to heaven for us, not all residents are as enthused about the smell of Thai food wafting into their windows in the wee hours of Sunday mornings when they’re trying to sleep. Many neighbors dislike the noise, smells, congestion and trash that Thai brunch brings, and some think the temple is just operating a restaurant under the guise of serving food to their followers. “It is a fundraiser as well as part of a religious and cultural practice,” said Sukum Saingarm, a temple board member. “They bring food to the temple as a way of merry-making. You get good with God by feeding the monks and the leftovers get fed to the people.” Hmm…they always seem to have a lot of leftovers. Although Wat Mongkolratanaram serves brunch every Sunday, a permit issued in 1993  limits the temple to only three food-serving events annually, and in June the temple was cited for continuously violating this permit. Yesterday, the temple went to the Berkeley Zoning Adjustments Board meeting to request a use permit modification which will allow the temple to continue its weekly tradition. We hope they were successful, because the thought of no more Sunday Thai brunch is scarier than Sarah Palin not knowing what the Bush Doctrine is. And for those of you who still haven’t gone, get over your separation anxiety from Thai Basil and go while you still can.